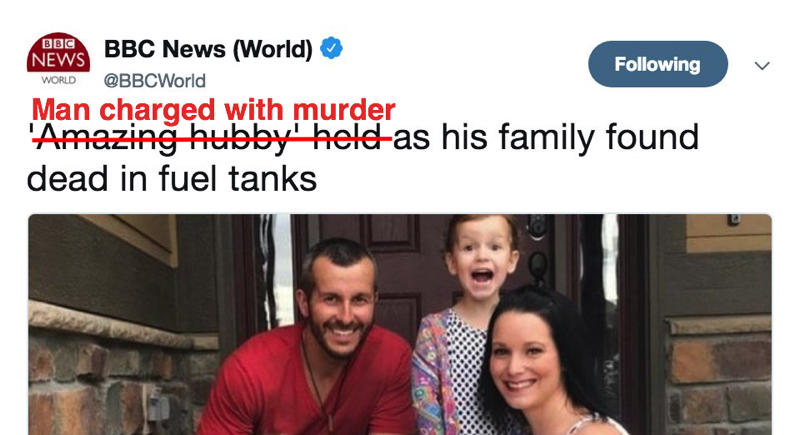 BBC World took the “he’s such a good guy” narrative to the next level yesterday by describing Chris Watts as an “amazing hubby” in the headline of a story about him being charged with murdering his pregnant wife Shannen and two daughters Bella, four, and Celeste, three. The headline was changed after an instant twitter backlash, but nothing is ever gone from the internet. Changing a headline because your readers react with disgust is a step in the right direction, but you still have to wonder about the process that led to someone writing the headline, subbing it, editing it and posting it on twitter when no one in that process either noticed or mentioned that maybe this was not an accurate description of a man charged with murdering his wife and two children. The “amazing hubby” quote came from Shanenn Watts’ social media posts about her husband. Maybe if you wanted to put the best possible interpretation on the original headline, you might wonder if the BBC was attempting to show that men who appear to be loving husbands and good guys can still wind up on a murder charge. But the Good Guy narrative is far too common, it’s almost embedded into media reporting on men who kill their families – although, of course, it never almost applies to men of colour or to men who kill women they don’t know. It will be up to the court to determine Watts’ guilt or innocence but in the meantime journalists should be past the point where they need to create a sympathetic portrait of him on the day he was charged with murder.